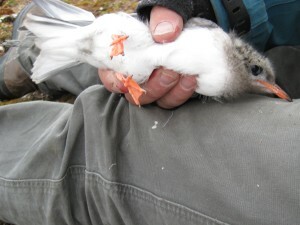 On Gerdoya, we discovered for the second year in row a large number of arctic terns nesting. While the nesting of this species has become rare since the fox is around, the nesting on the islands has increased. On Gerdoya, there must have been at least 200 nests. 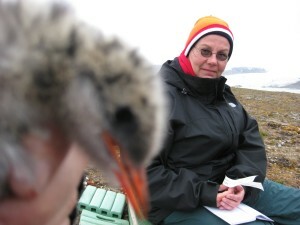 I go with Andrea Gr�ne to this island to ring tern chicks. On arrival we discover that a polar fox has discovered the food on the island. He must have swum over and has already been eating a third of all chicks. He looks like a devil. The adult terns must have been attacking his head and have plucked his fur. In between the ears he has to spikes of fur like little horns. Despite this fox we manage to catch 12 chicks, just before fledging. We ring, measure, swab and bleed these chicks. 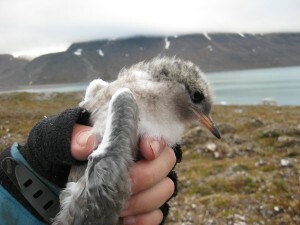 This page has been given the following keywords: [arctic tern] [birdhealth] [catching] You can click on each keyword to get an overview about related pages.